A Song of Fire & Ice | iiaa Ltd | The UK and Ireland distributor of Environ Skincare, jane iredale makeup and Advanced Nutrition Programme. Not Game of Thrones but a new season. As Summer gives way to Autumn colour, increasingly crisper conditions point to preparing a new programme of client skincare. Seasonal changes affect the skin. Colder temperatures, harsh winds, central heating and dry air reduce the Natural Moisturising Factors (NMFs), leading to dehydration, roughness and flakiness. In addition to exacerbating dry skin conditions such as eczema and psoriasis, moving from centrally heated environments into the biting cold can cause broken capillaries and make rosacea worse. There is also a dramatically increased chance of developing retinoid reactions. Another factor to consider is your client’s age. Oestrogen and progesterone levels decline as women get older which can result in dry skin, even in people who have never suffered from the condition before. In this instance, the issue may need to be addressed internally as well as topically. 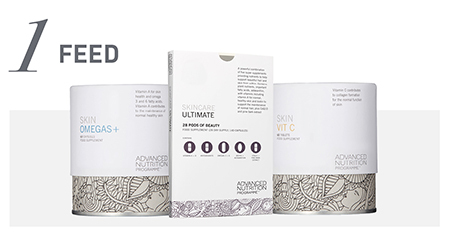 Although primarily designed to combat problem skin, Skin Accumax™ from our Advanced Nutrition Programme™ range has been shown to greatly reduce redness, possibly due to its anti-inflammatory properties. A common misconception is that clients should switch to a richer ‘winter moisturiser’ but in fact this can exacerbate dry skin conditions. This might seem counter-intuitive, because when suffering from dryness the first instinct is to reach for a heavier cream. In fact, this can have disastrous effects on skin hydration levels in the long term, as rich creams ‘fool’ the skin to stop the natural moisturising process. The answer is to use the correct moisturiser and enhance with boosters. “The balance of NMFs in the skin is upset when people use rich creamy products”, says Environ® founder Dr Fernandes. “People love them but their surreptitious and nefarious effects become apparent when they stop using these creams. They immediately complain of dry skin. What they don’t realise is that the reason their skin becomes dry is not because of the new less-oily product but because their skin is virtually depleted of NMFs and their stratum corneum is now incapable of holding in the water. All because the skin is under the misapprehension that moisture levels are adequate”. 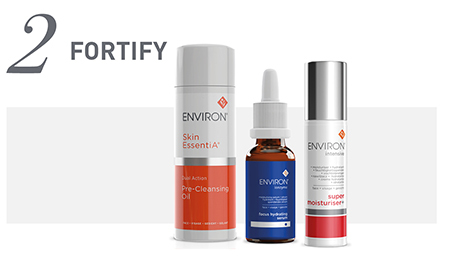 Vitamin A based creams like Environ® Skin EssentiA® Vita-Antioxidant AVST Moisturisers or the Youth EssentiA® Vita-Peptide C-Quence Serums contain active levels of vitamin A which enhance production of ceramides and keratins to keep skin moisturised at the correct level. The nutrients increase production of glycosaminoglycan molecules (moisturising factors) which enrich the space inbetween skin cells with water and therefore boost hydration levels. Step away from the scrub…. It may be VERY tempting to remove a dull, dry layer of skin, but not so fast with that granular scrub or micro-dermabrasion kit. “With exfoliation we remove the skin’s fine protective layer and water can easily escape. This results in the system becoming stressed by trying to restore the Natural Moisturising Factors, or maybe even to increase them beyond normal levels to try and make up for the water that is being lost through the inadequate stratum corneum,” says Dr Fernandes. A safer alternative is to use exfoliators with Alpha Hydroxy Acids (AHAs) which are much kinder to the skin’s protective layer, gently dissolving the ‘glue’ between cells, without the need for harsh scrubbing or compromising the integrity of the epidermis. A perfect antidote to help improve the texture and appearance is Environ’s Alpha Hydroxy Cream which smooths and refines the surface or Derma-Lac Lotion which contains sodium lactate to boost hydration levels – a few drops can be added to your clients’ vitamin A cream. Another simple and effective way to improve dry skin is to adjust a cleansing routine. The stratum corneum is extremely delicate and only 0.02mm thick, so it’s very easily damaged by soaps or cleansers which contain harsh chemicals or require vigorous techniques. Switch them to an oil-based cleanser which is far kinder to the stratum corneum and won’t strip skin of its natural lipids. 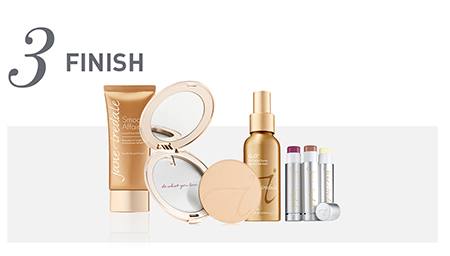 Skin can sometimes be particularly vulnerable to the elements after a professional treatment, so always end by using protective minerals from our jane iredale range. When the weather turns colder, it’s tempting to reach for carbohydrate rich, sugary comfort foods. Increase healthy fats such as nuts, seeds, oily fish and avocados and include an omega oil supplement such as Skin Omegas+ to safeguard essential fatty acid levels. The aim is to make healthy keratinocytes that produce the right keratins and ceramides to produce a healthy multi-layered stratum corneum and minimise transepidermal water loss. A course of Hydraboost or Active Vitamin facials will deeply hydrate skin with active ingredients such as hyaluronic acid and lactic acid to smooth and moisturise.